My son graduated high school this weekend. All the years of school…and now it’s over. I remember that feeling well, even though it’s been 24 years since I graduated HS (oh my heck, that’s a long time). As with any celebration, there should always be cake! 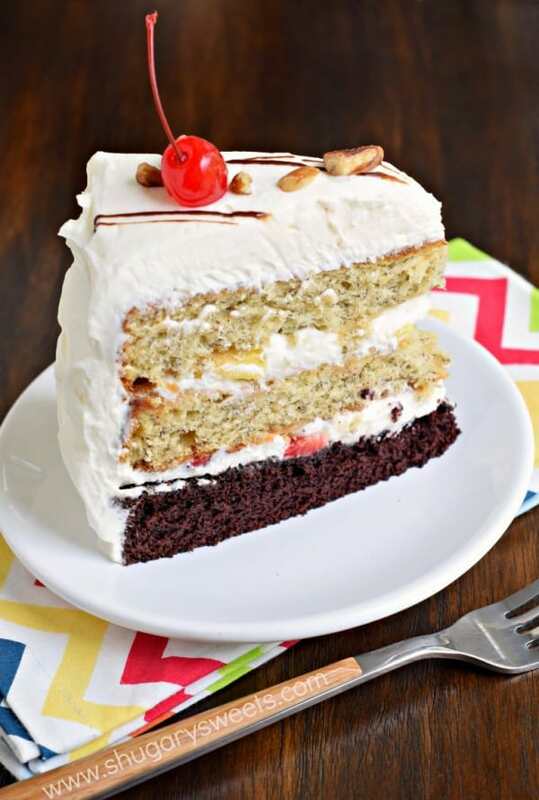 This Banana Split Cake needs to get on your menu ASAP. I started by making a single layer of chocolate cake, and a double layer banana cake. Three layers of deliciousness. Seriously. After creating the layers of cake, you’re going to make a huge batch of whipped cream frosting. I added in a little cream cheese to not only give a little flavor, but also make the frosting more stable. I’ve also used fresh strawberries and fresh pineapple for between the layers. I know I’ll get questions asking if you can use canned pineapple. And the answer is “probably.” haha. 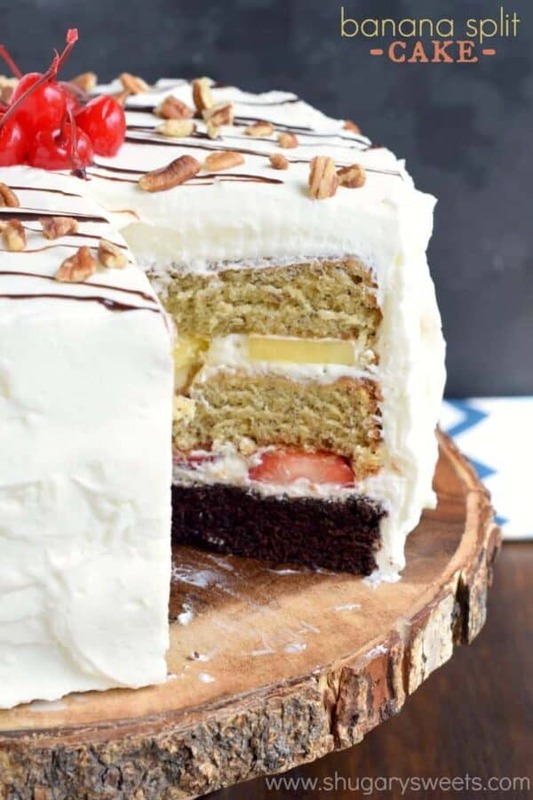 If you’re looking for the perfect Birthday cake recipe, or graduation dessert….or just something to enjoy with friends and family, this Banana Split Layer Cake is the answer! Now I’m going to go cry in my coffee as I think about how old my kids have become, which means how old I am! You can bake the cake layers ahead of time. If it’s the day before, allow the cake layers to cool completely, then wrap them in plastic wrap. If it’s more than a day before, wrap in plastic wrap, then in foil. Freeze until ready to use. Thaw at room temperature and continue layering according to recipe!
. No need to slice off any domes! I use an electric mixer with whisk attachment for making the whipped cream frosting. Be sure the bowl is clean and dry. I always like it to be cold! Add in the sugar slowly, and the cream cheese in small cubes! Use fresh strawberries and pineapple between the layers for best flavor. Let them dry out on a paper towel before assembly! Store cake in refrigerator (covered), until ready to use! 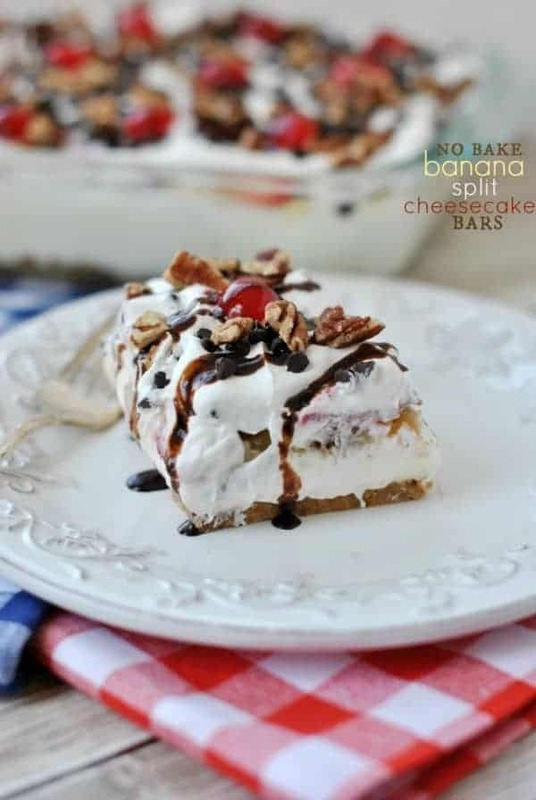 No Bake Banana Split Cheesecake Bars: this is as good as it sounds. Delicious!! 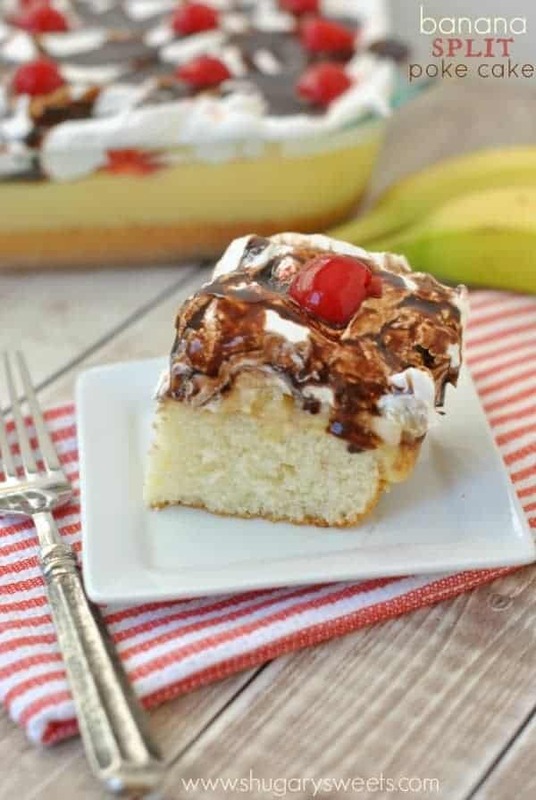 Banana Split Poke cake: perfect for potlucks and summer bbq’s! 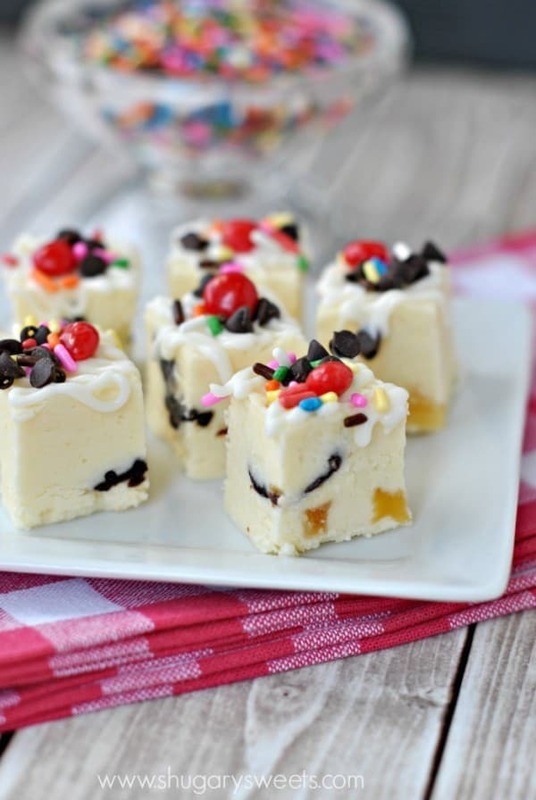 Banana Split Fudge: a fun twist on a classic dessert! This Banana Split Fluff Salad is a creamy fruit salad loaded with all your favorite banana split toppings. Stir everything into one bowl, and it’s ready to go. Banana Split Cupcakes from Your Cup of Cake–there’s nothing else that really needs to be said. They’re delicious of course, but they’re also beautiful. Decadent Banana Split Lush from Melissa’s Southern Kitchen is made with layers of cream cheese, pineapple and banana slices all drizzled with chocolate and lots of colorful sprinkles. Add a layer of strawberries, if you like and lots of toasted nuts. Top it all off with whipped cream and maraschino cherries then step aside. 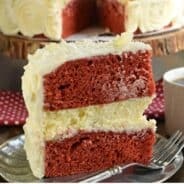 So many fun flavors in one cake! 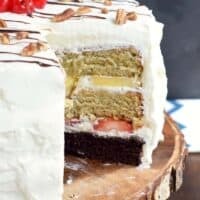 This Banana Split Cake has it all...bananas, pineapple, strawberry, chocolate, whipped cream frosting and more! In a large mixing bowl, use an electric mixer to beat butter and sugar for 5 minutes. Add in egg and beat until combined. In a small bowl, combine flour, cocoa, salt, baking soda and baking powder. Set aside. Combine coffee and milk in a measuring cup. To the butter mixture, alternate adding in the dry and the wet ingredients, beating well between each addition. Once the final addition is added, beat for 2 full minutes. Spray one 9-inch cake pan with baking spray and add the batter. Bake in a 350 degree preheated oven for about 25 minutes. Cool in pan for 5 minutes, then flip out onto a wire rack to cool completely. In a large mixing bowl, beat butter and sugar together for 3 minutes. Add egg, vanilla and ripe bananas. Beat for several minutes, until bananas are fully mashed and incorporated. Add the flour, baking powder, baking soda and salt. Beat for 2 full minutes. Spray two 9-inch cake pans with baking spray and divide the batter evenly. Bake in a 350 degree preheated oven for about 25 minutes. Cool in pans for 5 minutes, then flip out onto a wire rack to cool completely. In a large, clean, dry mixing bowl, beat heavy whipping cream for 2-3 minutes until stiff peaks form. Slowly add in the cream cheese and powdered sugar and continue beating for an additional 3-4 minutes. 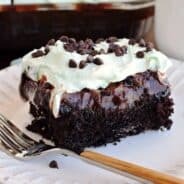 Place cooled chocolate cake layer on a cake plate. Top with a generous amount of the frosting, and layer the strawberries over the frosting. Add one layer of the banana cake and top that with more frosting and the fresh pineapple. Add the second layer of banana cake and frost entire cake with the remainder of the frosting. Top with chopped pecans, chocolate syrup and cherries. Store in refrigerator in airtight cake container. ENJOY. ** I love using Rodelle baking cocoa. If you can't find it in stores, you can purchase it here! 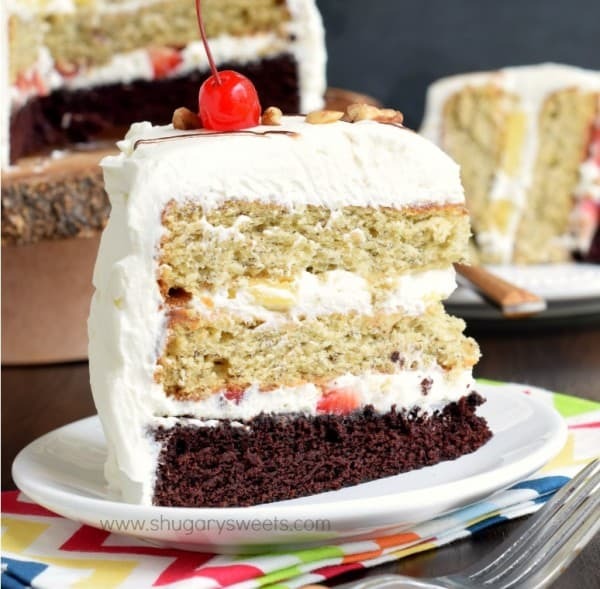 *Today’s recipe for Banana Split Cake was originally published on Shugary Sweets on May 18, 2015 and has been republished in June 2018. Congrats to your son on the graduation – such an accomplishment! As is this cake! 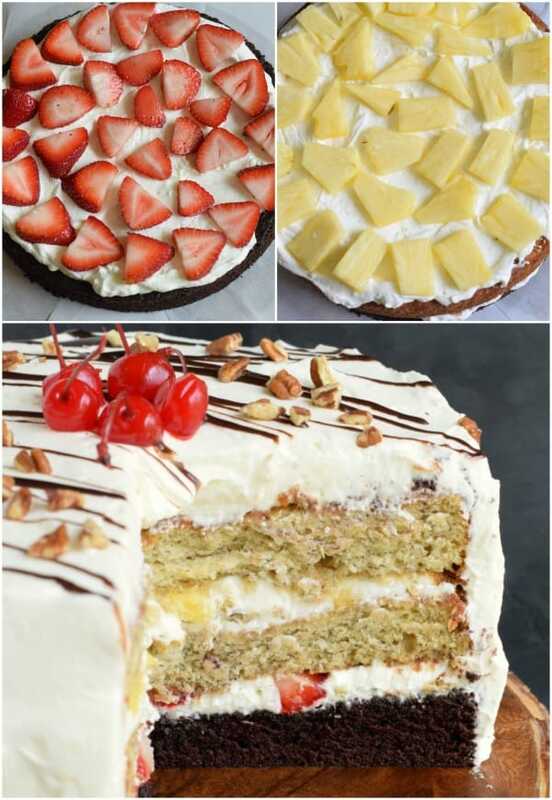 I don’t know if I could ever get the layers as pretty, but I would sure love to taste-test them! 😉 Pinned! Oh Aimee, I know just how you feel – my daughter just graduated from college last weekend! Our babies, all grown up. This cake looks like the PERFECT way to celebrate how wonderful they are!! College. I can’t even…haha!!! Congrats to your daughter! Congratulations on the graduation!!! I don’t even want to think about that right now. So, I’m going to think cake all day long 🙂 This is such a crazy awesome cake too!! I absolutely love every single layer you have going on in it! And I also love that you love banana split treats as much as I do!!! My daughter is graduating later this month. She is #5 to graduate but the other 4 graduated from homeschool … she is the first to graduate from conventional school. It is always so sad/exciting when this time comes. Congrats on this milestone! ANd the cake? OMGEEEEEEE …. I am so making this soon. I love it! Congrats to your son! Time really does go far too fast! Love this twist on a banana split!! Congrats to your son! This is one incredible cake! So perfect for a celebration! If I had to describe this cake, I would imagine it would involve a carton character with the eyes popping out and my jar hitting the floor! Aww, thanks Cyndi. I’m still in denial that he’s home this week because school is over, haha! 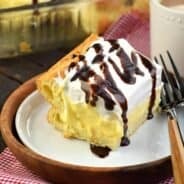 This looks like a great summer dessert. YUM! Graduations are the best. And this cake is probably the nicest way for anyone to celebrate. I’m very impressed! It’s gorgeous, too! I’m graduating soon! I can hardly believe it. This cake is ridiculous in all the best ways, totally gorgeous. Aimee, this cake would have made me happy on the occasion of my high school graduation! I’m still a huge fan of all things banana! It’s fun how many things are going on in this cake! That’s pretty much my MIND these days, haha!! Wow! This looks beyond amazing! The different layers are awesome! What a great idea! This looks great but I think it would be more attractive if the chocolate layer was in the middle. Is there a reason it was done with the banana layers in that order? I think this would be more attractive with the chocolate in the middle. Is there a reason for your order? Congrats to your son! And to you — because I think we all know all the work that moms do behind the scenes, no matter how old their kids are. This looks amazing — dang, those layers! Can’t wait to try it!